Absent from school? If your child will be absent from school, please call us (649-7034) and let us know. If you forget, you may receive a call from Nurse Dena later in the day. Happy 2018-19 school year! We wanted to let you know that our entrance is on the West side of our building for when you visit. We have a wonderful Multi-Purpose building to keep our kids safe should any severe weather come our way. THANK YOU Carl Junction community!! Our theme this year is ‘Bulldogs are Surfing into Success!’ You will be seeing ocean decorations all over the building. We always encourage reading in our building. We LOVE students to earn rewards for voluntarily reading with you or here at school. Students have opportunities to earn monthly prizes as well as a t-shirt that will match the ones our staff wear. This is not required, just one way we like to help encourage our kids to practice reading. Mr. Shorter is our building assistant principal. He does a wonderful job with kids and we appreciate him. We have one new teacher this year! We welcome Mrs. Schultz as a 2-3 Resource Teacher. As always, we promote our Bulldog Code of Conduct – ‘I am a Bulldog, I am responsible, I am respectful, I am safe! We love to keep our parents involved and informed. You will receive a monthly building newsletter through email so please make sure we have your current email address. If you need a hard copy please let your teacher know and we will make sure to send one home with your child. As always, you can call with any questions you might have. Our building # is (417) 649-7034. See you soon & remember to smile ~ it’s contagious! 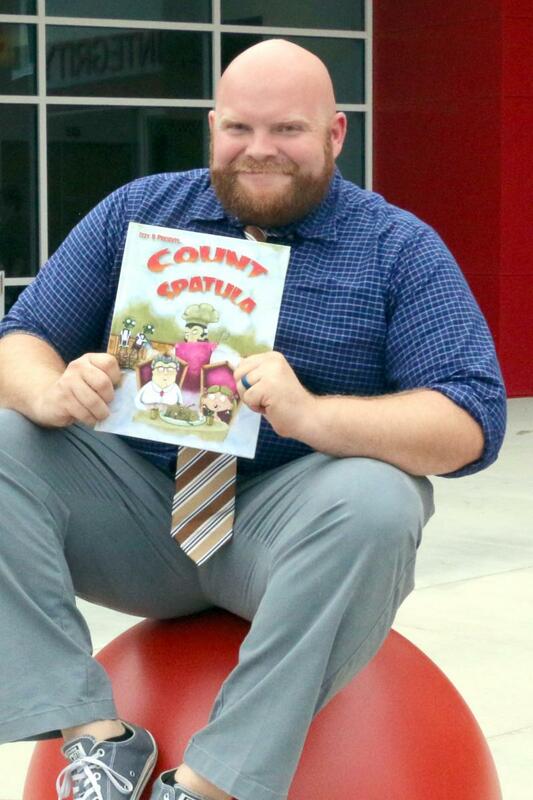 Basye releases a new children's book: "Count Spatula"
When he is not teaching 2 nd , 3 rd , and 4 thgraders the “home row,” Carl Junction Computer Lab Teacher Isaiah Basye moonlights as a children’s book author and illustrator under the pen name, Izzy B. His latest book, "Count Spatula," hits online bookstores this month. This is the fourth children’s book by Izzy B and this one, also features illustrations by the author. In 2016, "Count Spatula" was named the “Top Manuscript” by the Society for Children’s Book Writers & Illustrators earning Basye a ten-minute coaching session with the executive director of Penguin Press. The Joplin Public Library is hosting an Author Showcase to celebrate the release of Count Spatula. Come, meet Izzy B (Isaiah Basye), and join in the fun of Count Spatula. Many of us remember taking snacks to school on our birthday to celebrate with our classmates. There are times though that children don't get to have this celebration because their families cannot provide the extra snacks. The Primary 2-3 Bright Futures Site Council would like to make sure that every child gets to have a birthday with their class. If you would like to help us stock the "Birthday Closet," you may drop off individually wrapped snacks in quantities of 30 with a shelf life of 3+ months in the office. We collect Box Tops for Education and turn them into money to support the programs in our building. Tell your family and friends! Click here to see Box Top Products.